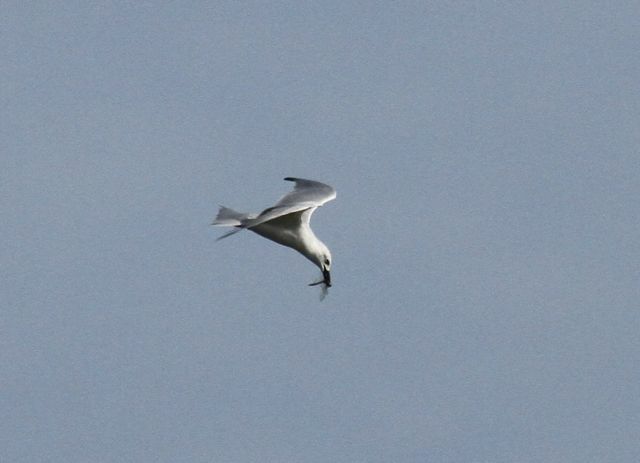 Gull-billed Terns and Audubon's Caracaras! 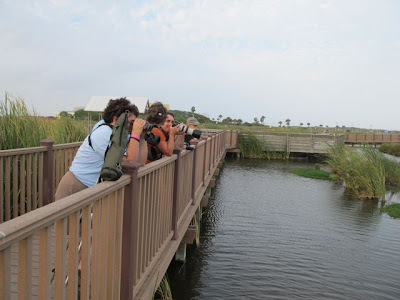 Lest you get the idea that our trip to Harlingen was one big photosafari, well, it was, but we were working too, leading field trips and giving talks. 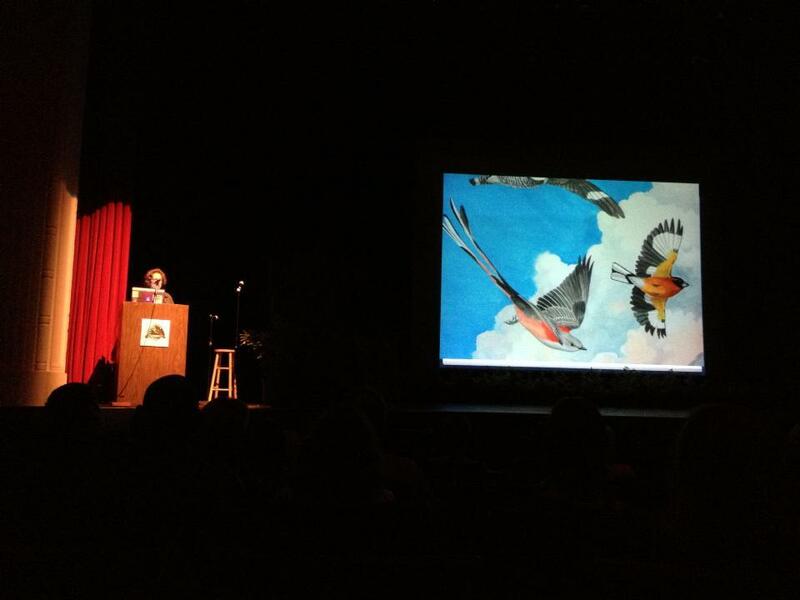 I gave a keynote about The Bluebird Effect, and Laguna Atascosa's nature shop sold out of my books. That was nice. Very cool perfectly exposed photo by my friend, superphotog Debbie Barnes. Got to meet some really cool people, too. This is a Zick sandwich made of Charles Alexander and Bill Thompson III. 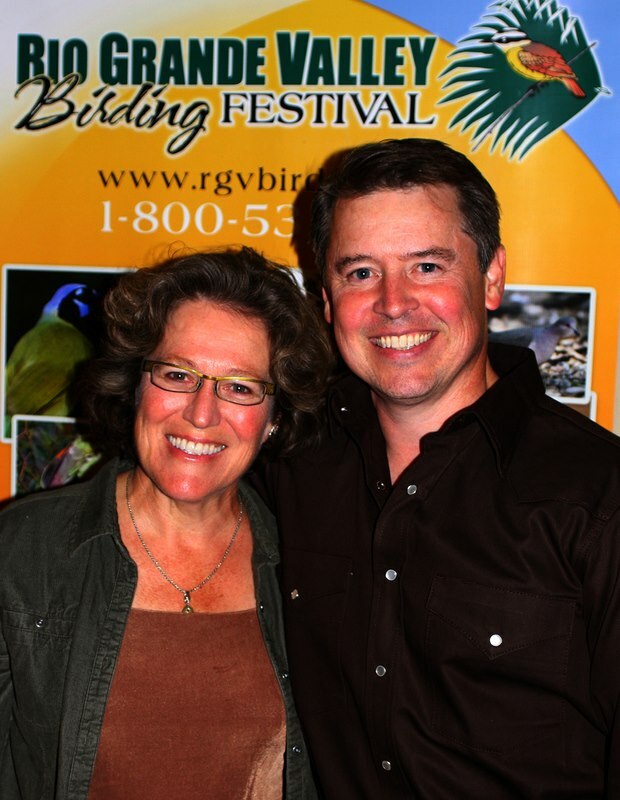 BT3 needs no introduction here, but Charles is a most excellent writer and painter of wildlife. A native Texan, he has a zookeeper background, a smashing accent, a bad case of wanderlust and a sensitive, thoughtful take on the animals he studies and paints. He connects deeply with animals he studies on an individual basis. Needless to say, the message in The Bluebird Effect hit him like a ton of (good, nice) bricks. It was a big thrill to meet him in person at last. And I liked being the chicken salad in the man sammich. Who wouldn't? You can see Charles Alexander's amazing work on Facebook where he also posts intriguing writings and historical snippets about animals. He's a voracious reader and deep thinker and I'm thoroughly enjoying getting to know him better. One of those people you wish you'd known for years. Birdchick had the honor of escorting actress Lili Taylor around the festival area. 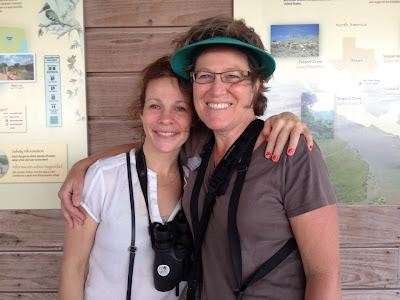 Little did I know, but the Lili Taylor who pre-ordered The Bluebird Effect in January was THAT Lili Taylor, who I've loved in every film she's graced. Mystic Pizza, Say Anything, High Fidelity, to name just three, not to mention HBO's Six Feet Under. Whoa. 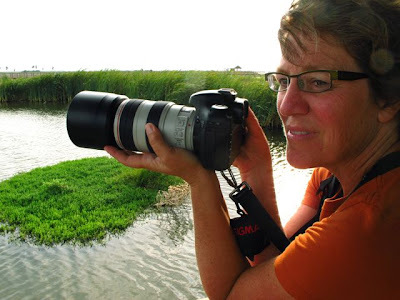 She's a birder. And for me, that only adds to her already sky-high coolness quotient. Plus, she and Birdchick make me look...sort of...tall... which is nice for a pygmy Science Chimp who gets towered over by two of the four members of her family. About to be three. I tried not to geek out too much but Lili was just so cool and delicate and lovely, like a fairy. I would not have been surprised to see a pair of dragonfly wings folded up in back of her shirt. And she came to my talk. 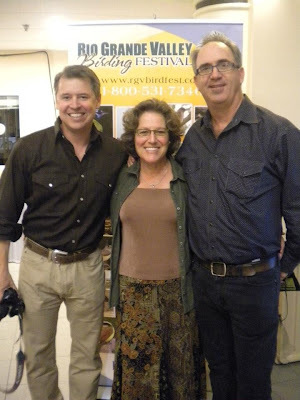 Thanks to Amy Hooper for taking these photos. It's nice to connect with someone whose work you admire. We met up with our Ohio friends Julie Davis, Kathi Hutton, Margaret Bowman, and Jason Larson on the boardwalk. 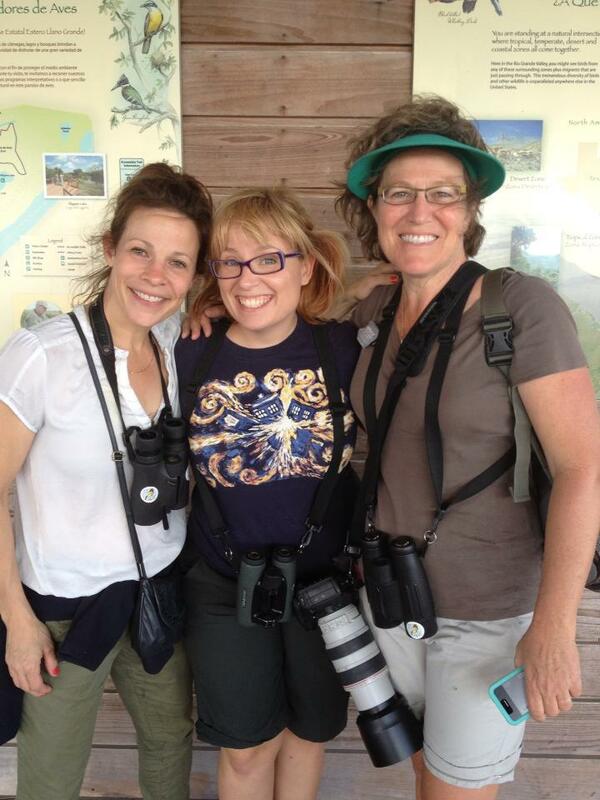 What a treat it was to experience these outrageous Texas birds with other similarly gobsmacked Ohioans. 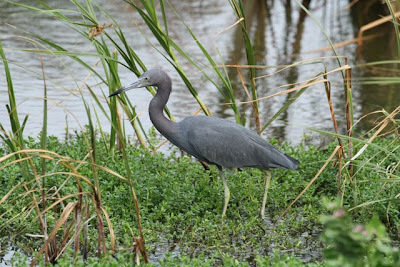 We decided that the little blue heron wasn't much like a reddish egret after all. 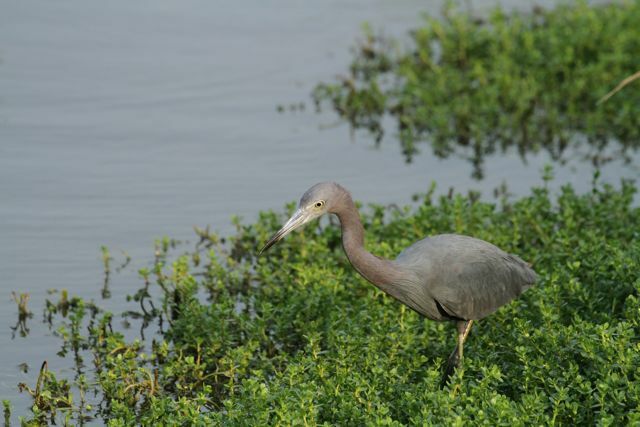 For one thing, you'd never catch a reddish egret wading through marsh vegetation, seemingly slowly looking for his lost contact lens. Reddish egrets are birds of salt flats, birds of extreme and fancy fast fishing action. And they have wild spiky hairdos. Ohio has largely escaped the Eurasian collared-dove invasion. I got Ohio's first of state record from our tower. Just too bad our rare records committee needed a photograph instead of Zick sketches and a painting. Not bitter, nope, not at all. That same fall a mourning dove hunter shot one. We've got 'em. And that carcass served to confirm my sighting. 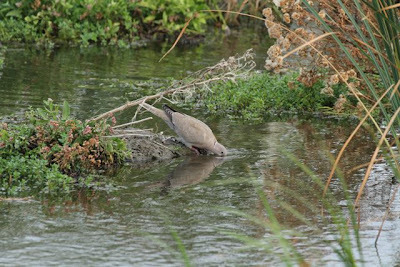 This Eurasian collared-dove is drinking in typical dove fashion, sucking water rather than dipping and let it trickle down its throat. I had thought this marsh was salt, but it's apparently brackish. Wonder if EUCD's develop salt processing glands in coastal areas? Wonder if they eat collards down south? 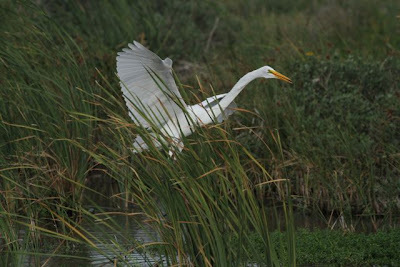 I always get a kick out of egrets. They are so decorative, and we have so few of them here at home. 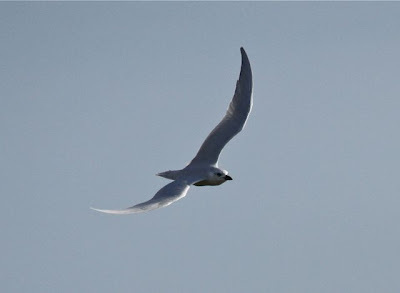 It was blowing a gale, probably 35 mph sustained winds, lifting even the short feathers on his sleek neck. 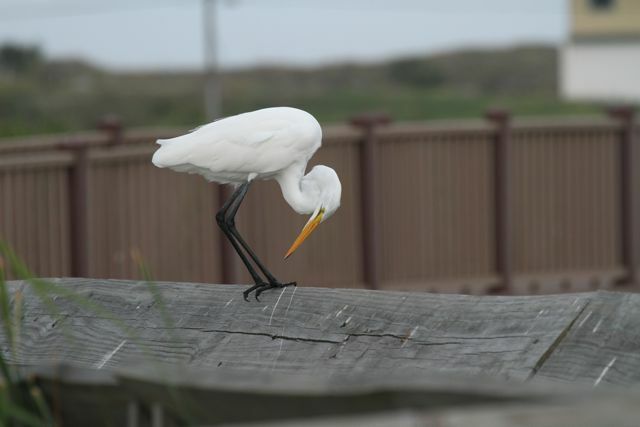 This is a behavior well known in herons and raptors, aptly called "foot staring." Nobody really knows why they do it; they seem to stare at their feet when in some kind of transition or conflict between behaviors. Should I stay or should I go? Or maybe he has an ingrown toenail. 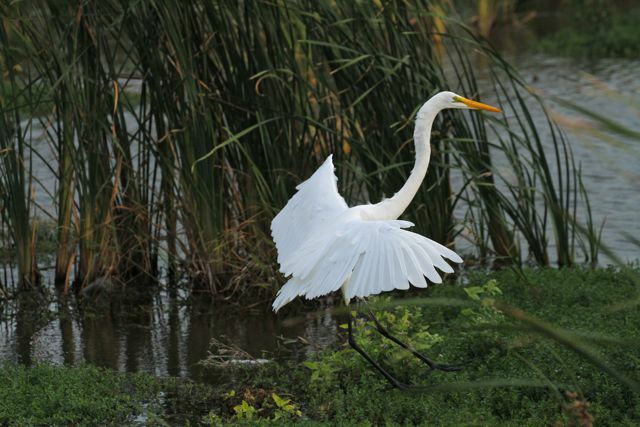 Or is wondering why he doesn't have golden slippers like the snowy egret. Who can say. He's staring at his foot. We all do that from time to time. 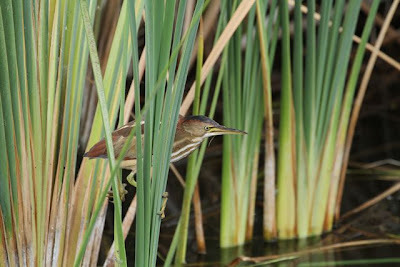 We enjoyed watching the least bittern turn from a football to a javelin at the flash of a shiner. When Phoebe spotted him, Bill took off for the distant part of the boardwalk where the other Ohioans were birding, netting Kathi and Margaret a hugely satisfying look at a life bird! Wow. That's a lotta neck all scrunched into an S-shape under those long feathers. 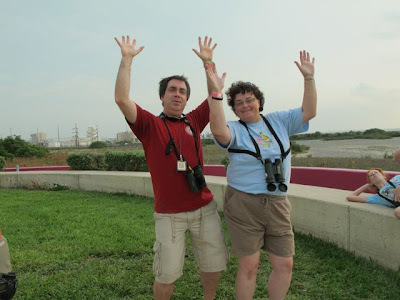 The Life Bird Wiggle, as executed by Jason Larson and Kathi Hutton. Bill demands it and is rarely refused. Kathi cleaned up on this trip. 43 lifers!! I got some life butterflies. Note Phoebs taking five behind the So. Padre Convention Center. Terrific view of marshes and flats there. And of happy Ohioans. In case you're wondering what my rig looks like, here 'tis. This is the Canon L-series image-stabilized 70-300 telephoto lens. mounted on a Canon 7D body. The black part is a lens shade, so the lens itself is extremely compact. As you can see the lens barrel fits nicely in my hand. Compact, reasonably light yet nimble and powerful, and death on flying birds, as you've seen. I do love it. So much. It rocks. So hard. I've linked right to Midwest Photo Exchange's page for each component, just to help Santa along. My strap is the Blackrapid RS-W1 sling camera strap, designed for women. One attachment point, with a screw, on the bottom of the camera. Padded and curve-friendly, very comfy. Don't worry, they work for men, too. Worn bandolier style over the far shoulder, so the camera hangs nicely at the hip and swings up for action. I lurve it. Just check that attachment screw (by the hook at the bottom of the camera below) each time you don the rig. Make sure it's tight and you're good to go. Otherwise your rig might fall into fine loose silty dust on El Costero Ranch and you might let loose a string of very bad words. photo by Bill Thompson III. Hair by Windy. I don't have a combover, yet. We're walking the South Padre Island boardwalk in Texas. It's like an amusement park for birdwatchers. 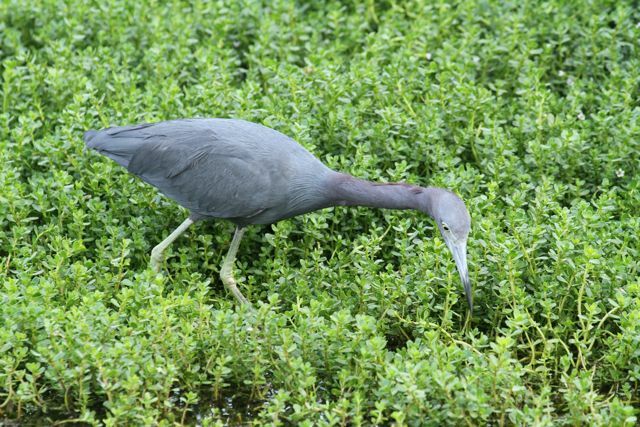 We're looking at the expected (great egret, little blue heron) when Phoebe stops dead with a "Mamamamalooklooklook what's this?" Well, that's a least bittern. 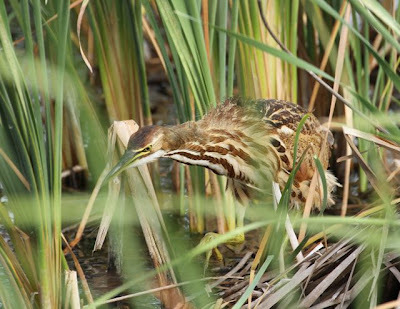 A bird I've seen in glimpses, heard cooing in Connecticut wild rice and North Dakota cattails, but never ogled for long. Learning later that this little character is well-known along this boardwalk did nothing to lessen the thrill of having our daughter point us to the best least bittern of our lives. He gave us every possible spraddled pose; he lengthened from little Nerf football to javelin. 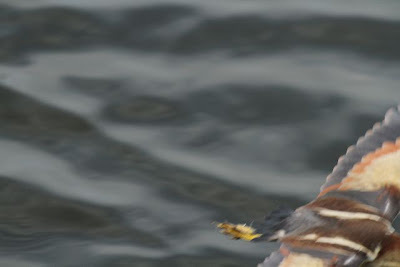 and I cussed missing the shot because he wears a coat of many colors and he looked like a Promethea moth in flight. Don't miss his tiny black tail here. Yes, we fell in love. We will come back to him because we caught up with him on the other side and banged away at him for the better part of an hour. It was so much fun. Sure, you see more great egrets in a lifetime than you do least bitterns, but they are so saurian, so fine, and they croak in the most splendid way when they fly. Awwwwk! Rawwwwwk! Raaawwwwk! The voice of the velociraptor is heard upon the land. 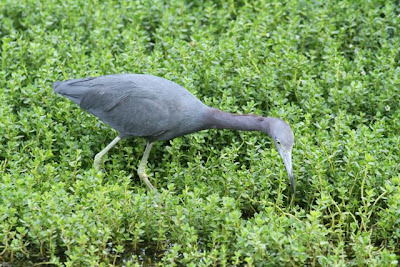 The vinaceous plum neck of the little blue heron enchants me. As you can see, the South Padre boardwalks associated with both the Convention Center and the World Birding Center (both of which centers were closed this fine Sunday afternoon) afford terrific photographic and birdwatching opportunities. The boardwalks remain accessible 24-7. Heavenly! Coming here was a huge delight for us. 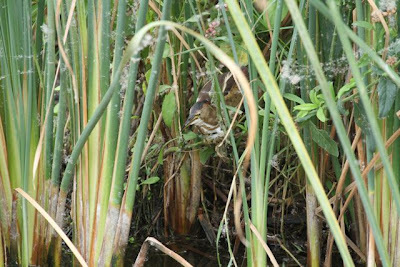 We met up with Ohio friends and birded the daylights out of that marsh. The wind was ripping along at a sustained 30 mph with gusts that tottered the Science Chimp. Yet there were birds absolutely everywhere. I could only imagine what we'd have seen had it been still. I come, hat in hand, to ask for a fish ID. South Padre Is. 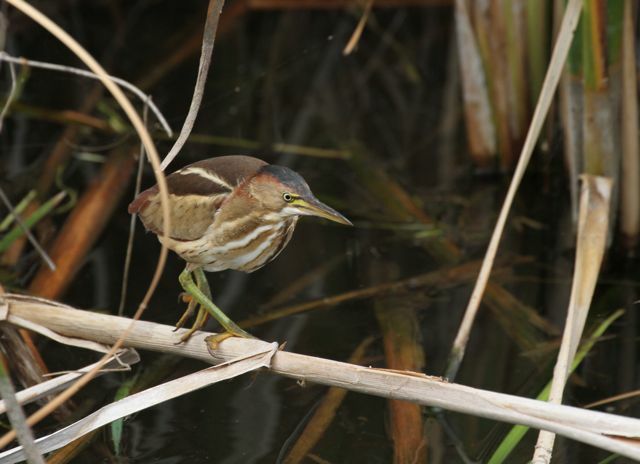 TX, mid-Nov., swimming in small schools in very shallow brackish marsh off the Convention Center boardwalk. Mouth downturned, suckerlike, pectoral fins oddly upward-pointing. This was not a momentary accident. They swam with their arms up. Maxed out at about 14". Very large eye. I wanted to call them bigeye suckers, but I know nothing about fish, so I stood there flapping my arms. 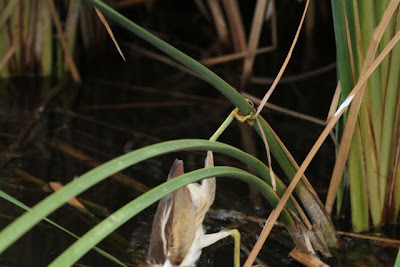 Audubon Guide has failed me. Need the Sibley Guide to Fish of North America. Floridacracker to Zick: Hey Zick! THAT is the real "chicken of the sea", a mullet. 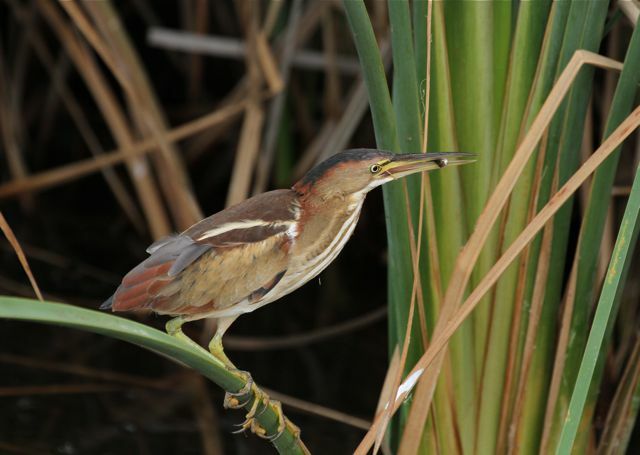 Historically, a fish of life saving abundance for early Florida colonists and settlers. Vital through every step in the foodweb, they are forage fish from the moment they are spawned...every predator in the sea loves mullet. They are grazers and algae slurpers.Also... they are birds, not fish. 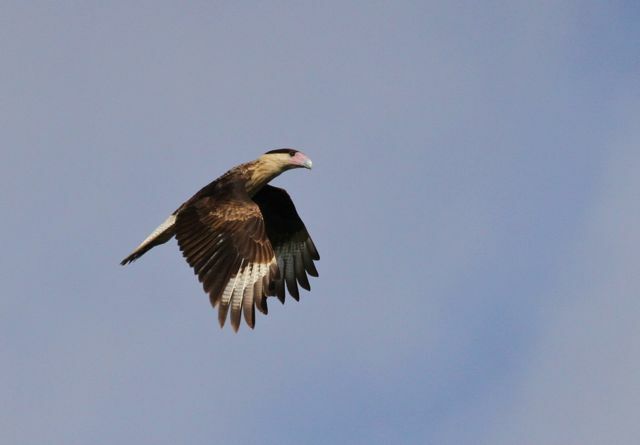 Years ago two poachers,who were caught redhanded with an illegal amount of mullet, argued in court that since mullet had a gizzard (they do) ... well they must be birds. I believe they won their case. Fried mullet gizzards are pretty yummy. Thanks for sending me a fish I know. Zick to Floridacracker: HEY FC! You're such a prince, handling my fragile Science Chimp ego with kid gloves. 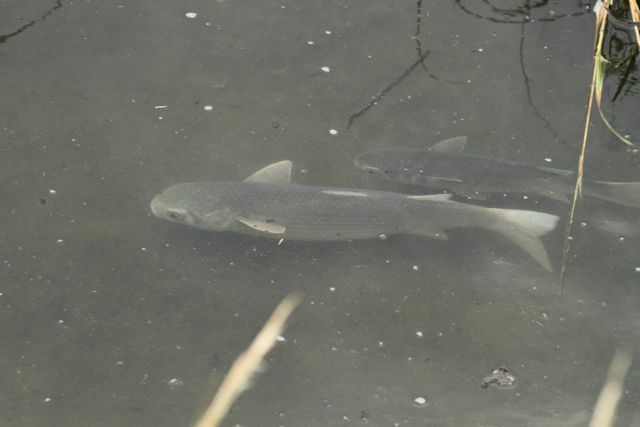 Mullet crossed my mind because I had seen them jumping in the brackish mangrove shallows at Ding Darling, but I couldn't imagine that a mullet had such big goopy eyes and flying fish fins. I realize that, for you, this is equivalent to someone sending me a picture of a pileated woodpecker and asking what on earth this strange creature might be. Marine life humbles me. So thank you for being gentle. 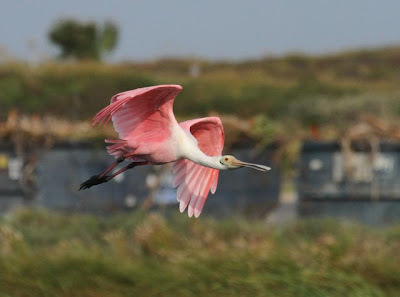 If you have never experienced Floridacracker's blog, PureFlorida, you have an amazing treat in store. I know many of my regular readers robinandrea are enraptured, but there are always those who haven't been exposed to his steady drip of subtropical natural history, cookery, humor, Labrador cuteness, underwater merman escapades, teacher tales, home renovation, and mudwallering ironman derring-do. And their lives are poorer for it. 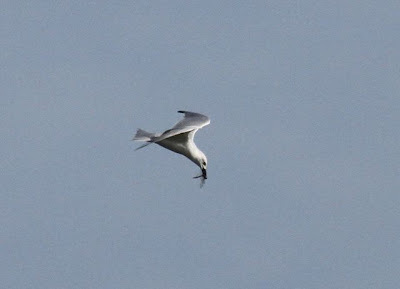 And overhead as I mull over what turned out to be mullet, royal terns cutting fleurs-de-lis in the sky. 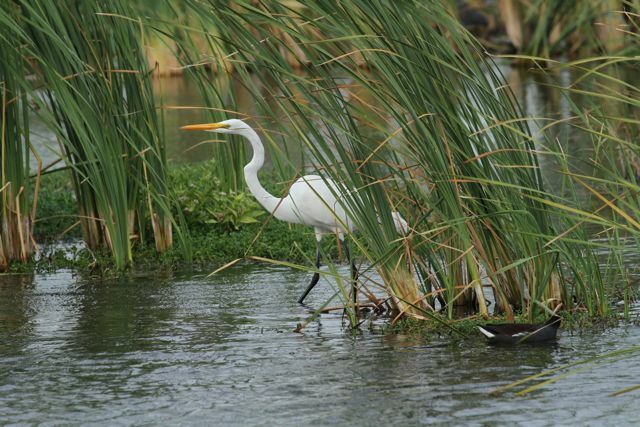 This year's babies are full-grown but still wheedling their folks for fish. Mmm-hmmm. Probably money, too. There are some really big things in Texas. As you get nearer to South Padre Island and the beach, they get bigger and bigger. Seashells. Dinosaurs. 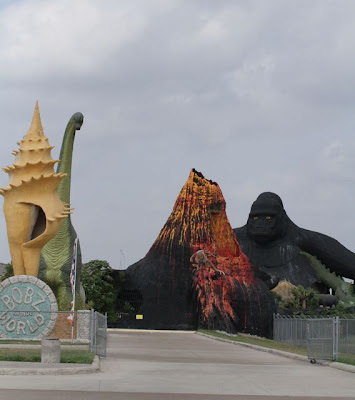 Menacing gorillas. Volcanoes. That kind of thing. 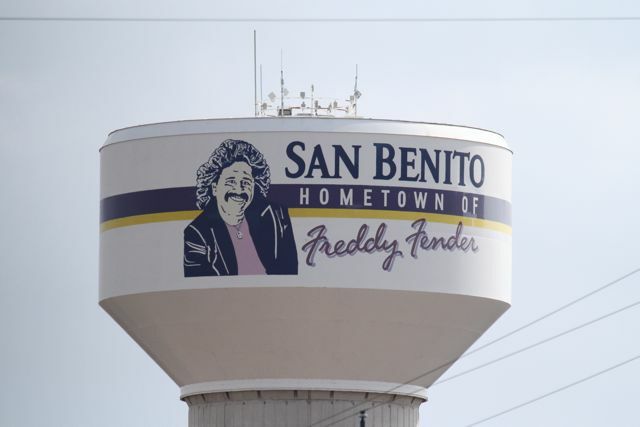 For whatever reason, perhaps Freddie's '80's 'do, this water tower cracks me up. It's big, too. We were after much smaller things. 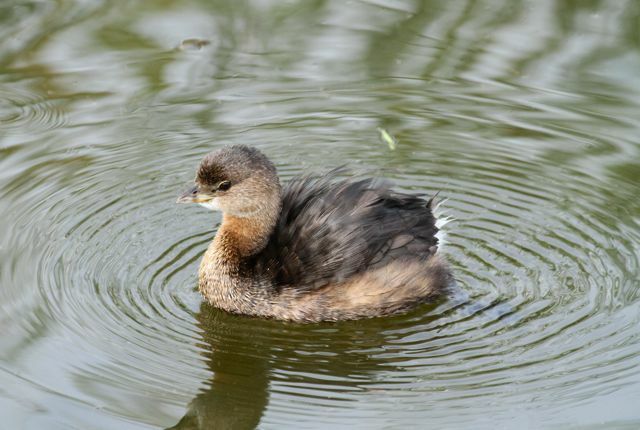 Like this leetle pied-billed grebe who was floating around preening hisself just off the South Padre Island Convention Center boardwalk. He's fluffling himself, and the vibrations spread as if he were a tuning fork. I don't really understand how grebe plumage can be at once so fluffy and waterproof. I think it has to do with sleeking down, and abundant oil in the feathers. 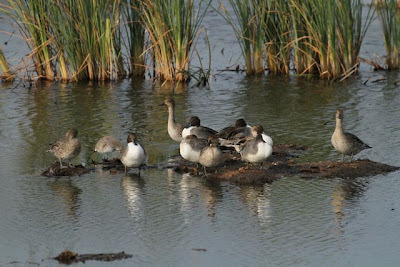 Really, though, they look like feather dusters, and you wouldn't dunk one of those in the water and expect it to float. Just another mystery to leave unsolved. 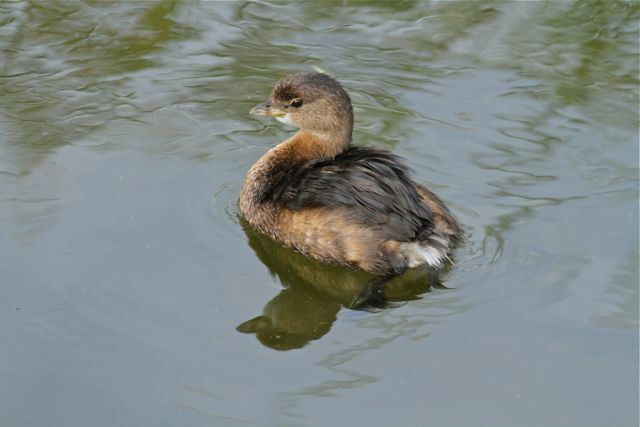 I had a pied-billed grebe in my hand who had hit a powerline years ago. He weighed a full pound. I was amazed at the density and heft for his size. Ballast for dives, I guess. 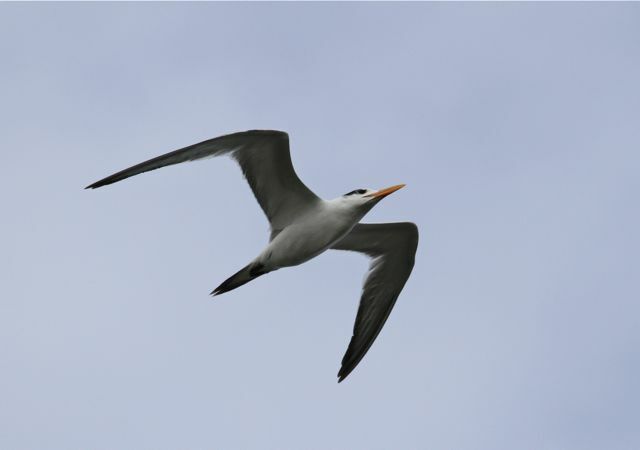 They're powerful birds, who migrate at night on tiny narrow wings. 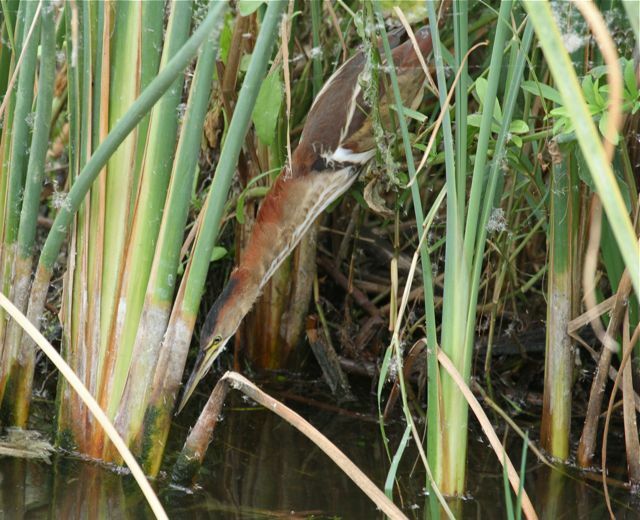 So much we don't know or appreciate about grebes. 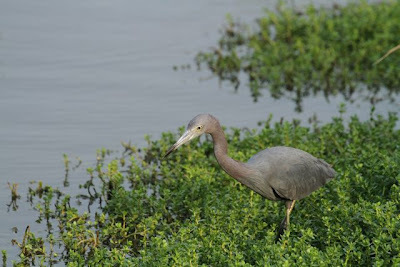 They are extremely cool birds. There were so many wonderful things hidden in the reeds that walking the marvelous boardwalks was like being in a Highlights for Children double-page spread. Oh look. 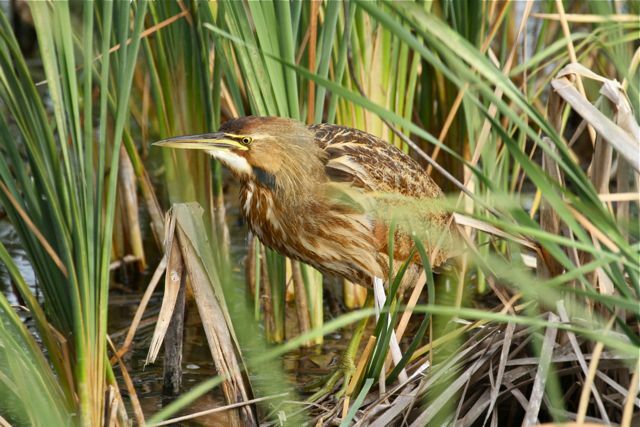 An American bittern! who sleeked down when he saw a small fish. 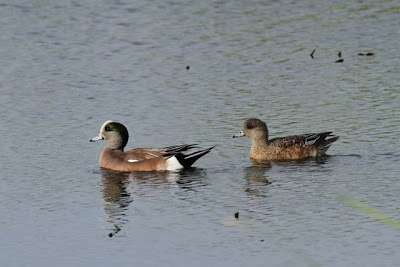 Most of the dabbling ducks were in eclipse plumage in early November, but this drake American wigeon was impressing his mate with fully molted raiment. He's ready to display. 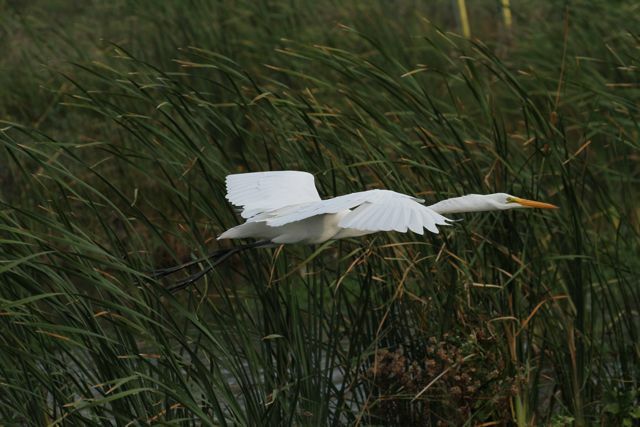 And in flight. What a gorgeous sight. 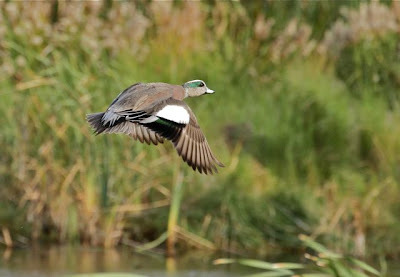 Oh, I would love to spread that wing and feel that velvet green speculum. Ahh, crap. 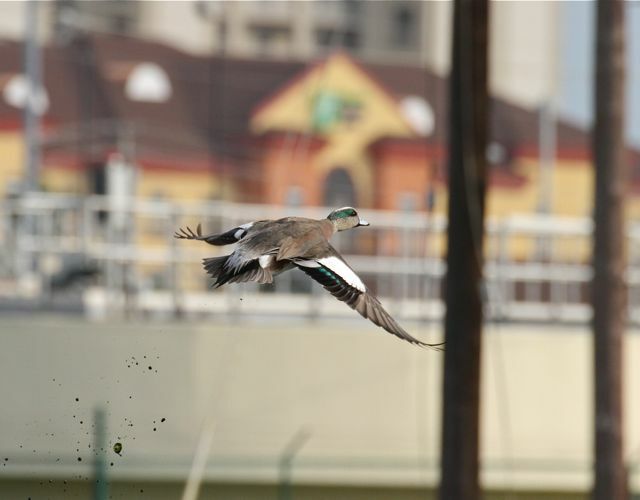 You're poopin' up my flight shot, Mr. Wigeon. Spoiled anyway by the hotel behind. 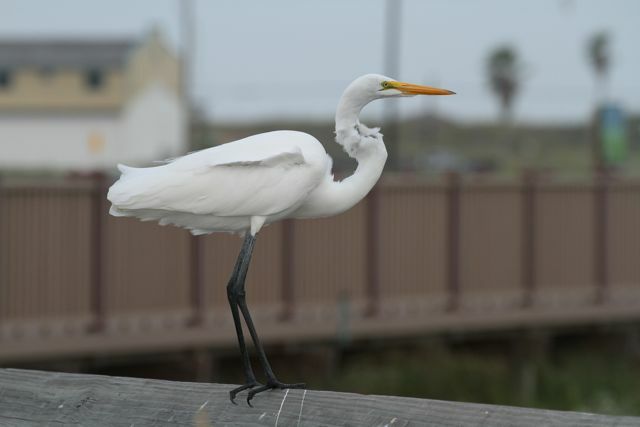 This photo does convey the sharp contrast of wild and insanely built-up that is South Padre. Or any beach area, for that matter. Sigh. I see the wildlife crampacked into the tiny refuges and wonder what it must've been like before the giant hotels and condos and restaurants and tattoo parlors and beach towel/sunglasses stores crowded it all into pockets. Beaches. I love 'em. But coastal areas swiftly drive me nuts, because the balance is usually tilted toward all those giant things, and the throngs and their dopey thongs. Poo on that. We should leave more room for wildlife. Tear some of those buildings down and bring the marsh back where it once was and ought still to be. 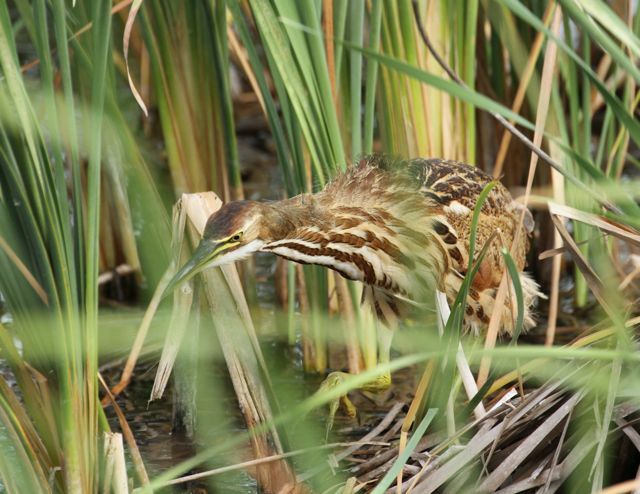 Having vented, I'm deeply grateful for what remains around the Convention Center and the World Birding Center. I guess I'm just greedy for what used to and ought to be here. And will never understand how a row of sunglasses stores could have taken precedence over a vital breathing living nursery for fish, crustaceans, invertebrates, and birds. How many damn beach towel stores does one town need? In my mind I'd love to be a sort of Carrie Nation for beach development, busting in and swinging my ax around, riding a bulldozer in my big long flouncy dress. The pintails were looking a bit shabby by contrast to the wigeon, if such a graceful greyhound can ever look shabby. The challenge as a photographer is to get the birds framed up in those golden moments before they fly across the facade of the hotel, the marina, the electrical tower. 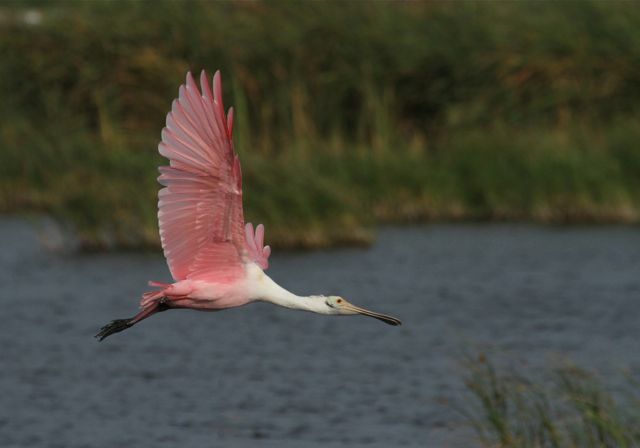 Bill of the Birds took these two roseate spoonbill shots. I forget why he had my camera in his hands but he responded beautifully to GIT 'IM GIT 'IM GIT 'IM which is what I hissed when the spoonbill took off. Ahhh. There you are. A million miles, visually, from Big Johnson's Bar. And just a couple of wingstrokes away. 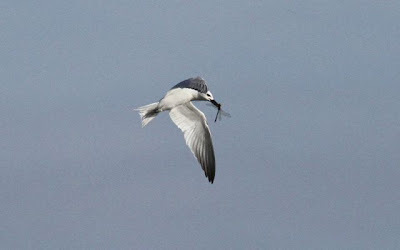 Rio Costero Ranch, near Laguna Atascosa NWR in south Texas, offered us killer looks at a bird little-known to me: the gull-billed tern Geochelidon nilotica. 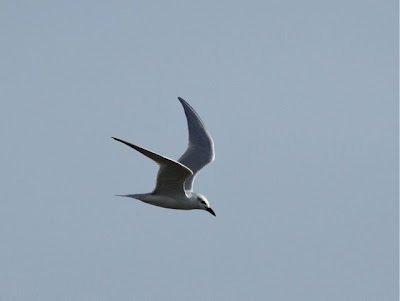 It gives the impression of a very slender-winged gull. 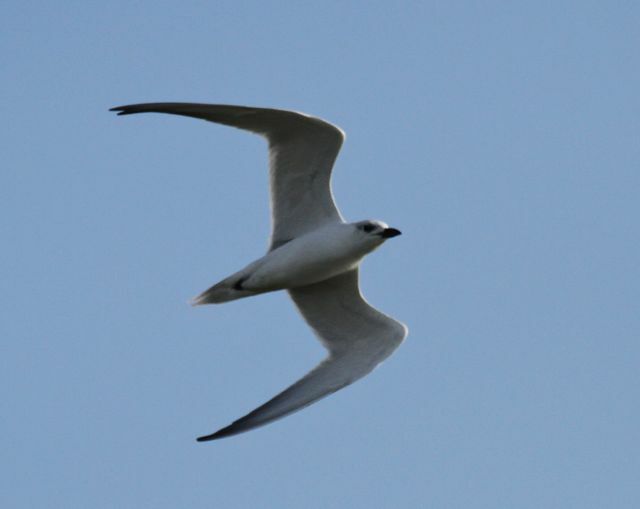 The heavy bill enhances its gull-like appearance. It's distributed worldwide, from both coasts of North America, the east coast of South America to southern Europe, temperate Asia, and even Australia! Oh what a beautiful and welcome sight. I drank it in and took many souvenirs. These birds were eating the bug du jour: dragonflies. 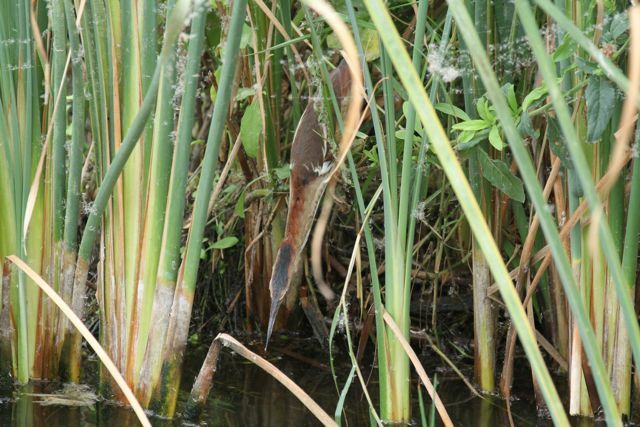 More specifically, large green darners, perhaps Anax junius? Not sure. But they were big, and there were a lot of them. Anax is a migrant, and it travels in large flocks. I would imagine that our Ohio darners have been in Texas for some time by now. The gull-billed terns were dipping down and snagging the darners in flight. Which has to be tricky. Dragonflies are wicked fast and can change direction in a nanosecond. 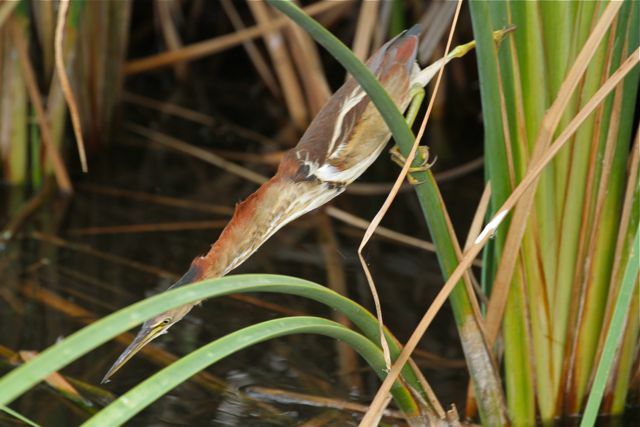 I admired the aerobatic skill of these beautiful birds as they made their meal on darners. And delighted in seeing the prey, revealed by the lens. Which is a Canon 70-300 IS L telephoto on a Canon 7D body. Oh, just get yourself one. Click on the link. 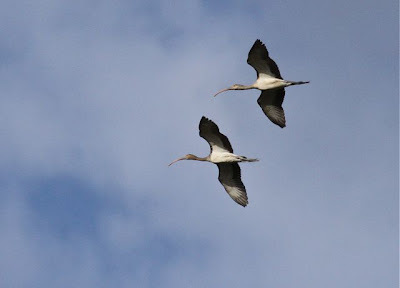 Other birds came by in perfect light, like these young white ibises. Ibii? I love this shot. Such harmony of pose and purpose. 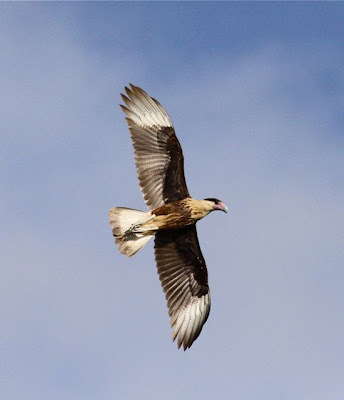 But my favorite shot of the day was an Audubon's caracara, flaring overhead. Ahhh. After awhile, your photographer's eye just knows when you've nailed it without even looking at the result. Strong morning light, blue sky, AV central dot focus, go. And you've got every darn feather delineated. Oh, I love my new rig. Hard to believe I'll have had it a year in February. It's had a workout! This odd tropical raptor takes carrion, insects, eggs, snakes, lizards, rodents...small prey, anything it can subdue with its short toes and long legs. They often walk around and hunt, sort of Dinornis style. In fact they remind me very much of dinosaurs. Bill Thompson III and Al Batt, who had them rolling in the aisles Friday night, puzzle over a pair of white-tailed hawks. 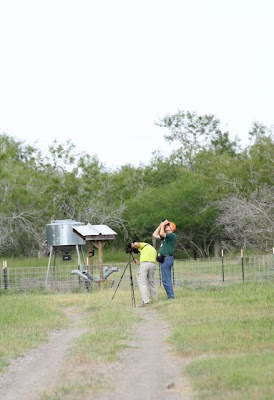 It was a good morning's birding at Rio Costero Ranch and the Rio Grande Valley Birding Festival.